The News app is bundled in modern versions of iOS, accessible from the home screen as a standard app icon and from the Siri Suggestions screen in Spotlight under the News section on an iPhone or iPad. 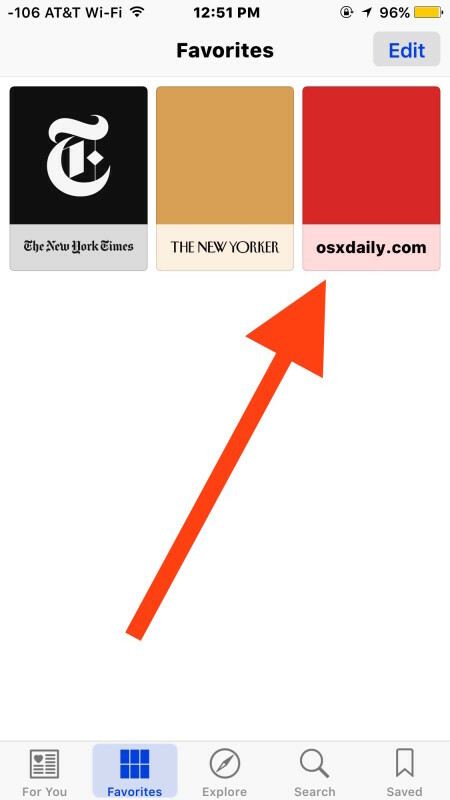 While News app includes a handful of curated Apple-approved sites, users can customize the app on their own by adding websites they like, and also use the News app as an RSS reader. This allows you to add just about any site or feed to News app yourself, including great sites like this one. Now you can launch News app and under the “Favorites” section will be the RSS feeds and websites you added yourself, making News app into an RSS reader of sorts that is built directly into iOS. This is nice in that it allows you to add whatever websites and feeds you want, even if they aren’t pre-bundled in the official list within Apple approved sites. * Apple News app basically aggregates from RSS, but the News app is not particularly good at detecting RSS feeds on many websites, and so you’ll often have to navigate directly to the RSS feed in question and add the actual RSS feed URL to news directly. You can sometimes get around that by requesting the desktop version of a site from Safari in iOS before attempting to add it to News, but going directly to the RSS feed may be more reliable. Perhaps this will be fixed in a future version of iOS and News app. 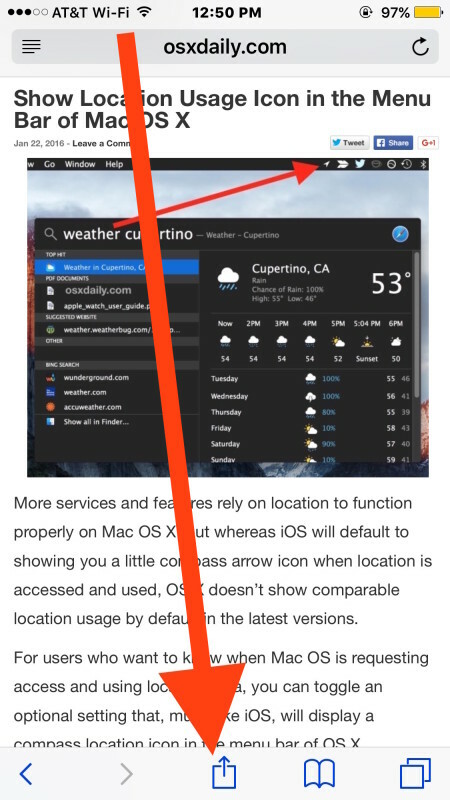 News app is included on iPhone, iPad, and iPod touch in iOS 9 and later releases, if you don’t see the feature it’s perhaps because you have not updated the version, or because the News app is having a hard time detecting the RSS feed for the site, as just mentioned, if that’s the case simply load the RSS feed directly before adding it. Of course, some users may recall that iOS Safari has a Shared Links feature that can also subscribe to RSS by way of Twitter accounts, so if you have no use for News app you can still subscribe to your favorite websites by way of Twitter as well. For Mac users, there isn’t a dedicated built-in News app, but you can instead add and subscribe to RSS feeds directly into Safari within OS X, add them to pinned tab sites, or just visit webpages directly in the Safari browser. Thanks, but I don’t use Apple News and I don’t want to. Give me a real RSS reader any day, or even Twitter. Apple News is a poorly thought out app for users, and it sounds like it’s just as poorly thought out for publishers! Another typically poor quality Apple endeavor coming out of the Edward Cue division, put it right up there with Apple Music and iAd in the ‘junk’ list. I’ve never used any RSS reader. Just out of curiosity, why do you like RSS and what do you look for in the readers you’ve used? The main reason I like RSS feeds is that I only have to go to a single source to read the new material from several dozen websites all at once, rather than heading over to each site individually. So imagine you want to stay up to date on the latest Business News, Sports scores, and updates on the 2016 Election News: if you subscribe to various websites’ RSS feeds via a reader, all this information will come to one place for you rather than having to login to ESPN, CNN, etc. etc. Unfortunately, RSS feeds seem to be a thing of the past because many sites no longer support them. The Apple News app may have region restrictions for use in some countries and not others, but that is not related to our RSS feed. “The Apple News app may have region restrictions” is a bit of an understatement. I use Apple News on my iPhone in Austria, Europe, without noticing any problems. I’m using it in Mexico and was able to add even non-us sites, some in spanish. Well you’re not missing much, the News app is junk. Use RSS, Twitter, Pocket, Nuzzel, etc, anything is better than the News app which is a poorly maintained walled garden with no indie sites included, all big corporate junk Apple can sell ads against. If I could delete News from my iPhone I would, it takes up space and serves no purpose. It does as long as you set the region to US, Uk or Australia on your devices. I have mine set to US and use the app while in Mexico with no problem. I was even able to add a few sites in spanish using the method described here, which I had figured out on my own long before this article was posted and mentioned in a previous comment on another article. I have no idea how it works, but I got the same message (that the channel is not available in my region) and I’m in the UK, which is a supported region. It’s obviously got something to do with FeedBurner. Even despite this, I discovered that while OS X and iOS Safari “Shared Links” sync, News does not appear to make use of those subscriptions. 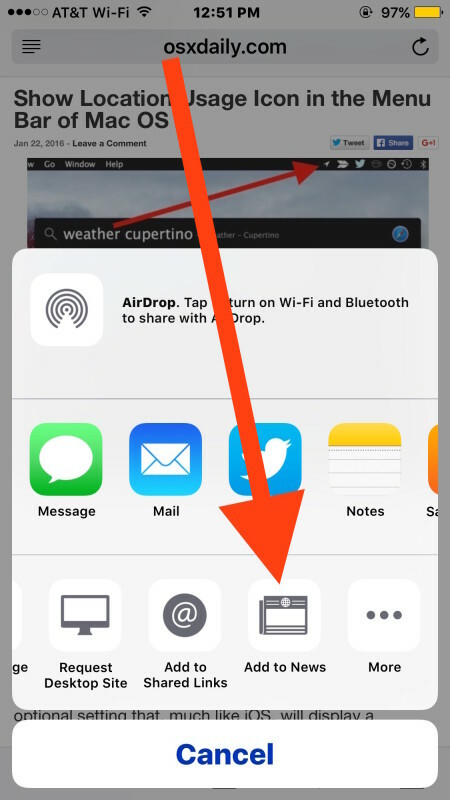 I don’t have an “Add to News” option in Safari although I have the News app on my iphone 6 running 9.x. Any ideas why it is not there? Yes I also clicked on More and checked there…. UPDATE: The functionality described here was disabled by apple in iOS 9.3.3 and later versions. It no longer works. Now the only channels available are the ones offered from within the news app. That is correct they want to jam everyone into their cruddy News app, no thanks! It’s all rubbish! This no longer works for any website that have not registered with Apple’s News Publisher platform (https://developer.apple.com/news-publisher/) — and that’s the vast majority of websites. It doesn’t work at all anymore, not even with the websites registered. 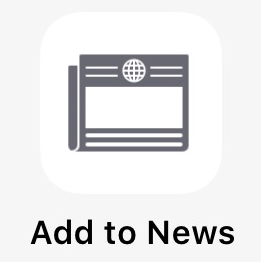 Now the add to news icon is just a beautiful ornament in the share sheet. Yeah, sadly. No wonder they renamed the icon as “open in news” in later iOS versions.